After bringing a new face to Cuban media and journalism Yoani Sánchez has been awarded several journalism awards over the years, some of which have caused controversy within Cuban media, to now surpassing that with her greatest achievement to date, the launch of a new Cuban news outlet 14YMedio. 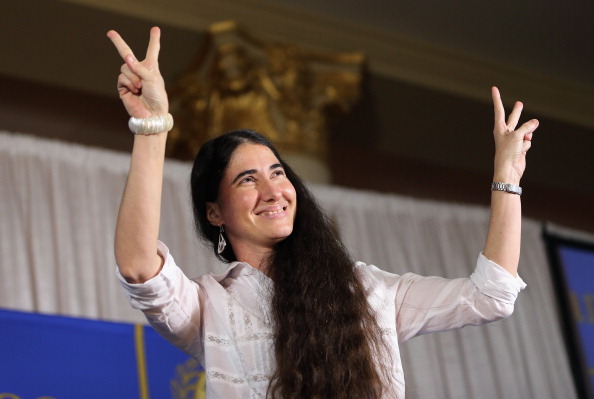 Born September 4th 1975 (aged 39) in Havana Cuba, Yoani was subjected to hardship from an early age. She attended primary school during a time that the Soviet Union was providing considerable aid to Cuba, however due to the collapse within the Soviet Union years later education experienced a detrimental hit to its finances, which left Yoani in a period of despair. After her time in university Yoani acquired disgust for high culture and Philology (her chosen field of study), which subsequently led to her leaving Cuba for Switzerland where she acquired an interest in computer science. Upon Yoani’s return to Cuba with her newly acquired capabilities in computer technology, she went on to develop a web Blog called Generación Y in 2008. Generación Y was a blog aimed to help her deal with the frustrations she felt with the situations occurring within Cuba. The Blog became a huge hit, which is one of the main reasons of her success to date; however the success came at a cost. Generación Y was available in 17 languages and was highly popular with some of the world’s most influential people. Obama in 2009 wrote that “her blog provides an unique insight to the reality in which is daily life in Cuba, and found it empowering to fellow Cuban’s to express themselves freely through the use of technology”. However, the blog was targeted by Cuban state security due to her ability to freely express Cuban situations which journalists were forbidden from. This eventually led to here blog being blocked by the Cuban government, which only lead to the ever-increasing popularity of her page. In 2009 the page became available again and she continued to proceed with her posts. From her consistent hard work, determination and honesty, her blog has won her prestigious awards such as the Ortega and Gasset Journalism Award in Spain however; she was forbidden to travel to the ceremony, only under speculation that it was by the Cuban government. This didn’t stop her from continuing her work. Later in her career Yoani and her husband were arrested in 2012 in an alleged attempt to prevent her to write about a controversial trial about a politician Angle Carromero, who was believed to of crashed a rental car killing a Cuban political activist. After the release of her arrest despite all hardship Yoani again proceeded with her work, which brought the first independent digital media outlet in Cuba, 14YMedio. This, like all previous work by Yoani was subject to controversy from the start. 14YMedio focused on a variety of topics such as politics, culture and society, however within three hours after 14Ymedio published its first edition on the Internet, it was hacked. Internet technicians later on tested to reveal it was the Cuban Government that in fact hacked the page in an attempt to rid Yoani from the media light. The action from the Cuban Government provoked reactions from the international arena, which subsequently led to the re-opening of 14YMedio and has continued worldwide growth. Yoani’s determination enhanced the power she had in the eye of Cuban civilisation, and clearly expressed the fear the Cuban government had for her and her ability to freely express. Yoani shows that no matter how big or how small, freedom to express yourself is something everyone should have. Yoani’s activism is to express the hardship that is circulating throughout Cuba. She is a strong, influential woman that emphasises empowerment and freedom. This is why I believe Yoani Sánchez should be included in my “How Women Change the World” series. Next Post I’ve been nominated for an award!